I didn't have any money to spend but I did have some Boots Advantage Card points, yay for previous spending. I got these 2 Models Own nail varnishes, my first from this brand. And the pictures I found match so well in size don't they!? They are both from the Beetlejuice collection. All of the shades are beautiful and I think, when purse permits, I may get a few more of them. That was all I bought on Wednesday but I did find a few more things for my 'buy one day far off in the future' list. I am truly becoming a magpie, all day I was drawn to glitter, whether it was in a form I would actually wear or not. My sister bought a concealer from Bourjois so I was distracted by one of their intense Eyeshadows. I stupidly did not look at the name of it and their own website is rubbish for telling the colours but thanks to your beautiful swatchers out there I've found it. It's 03 sand rose. If you want to see it in detail check out this site. Next, on to something I would probably never wear but is gorgeous all the same. We went to MAC in Debenhams and straight away I was drawn to the Hey Sailor! 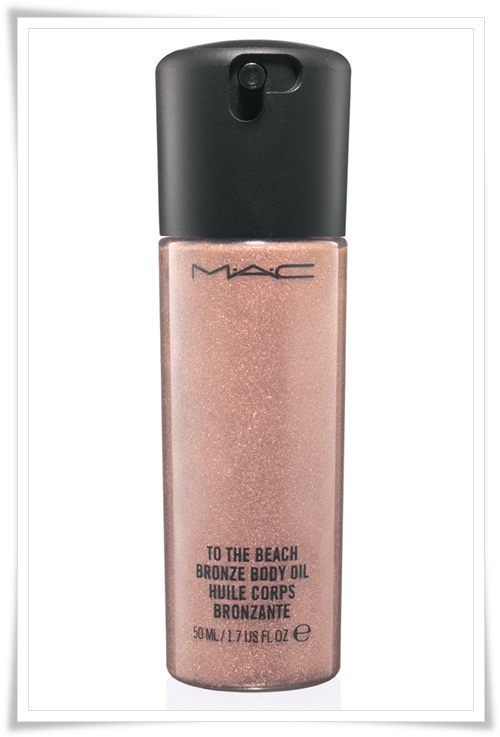 'To the beach' bronze body oil (what a mouthful) in Seaside. I can't imagine a time where I would actually cover myself in shimmery oil apart from to maybe stare at myself. I doubt I will buy it but I will probably go back just to rub it all over my hand again. I am SO impressed with Topshop make-up. All I've bought from there so far is a lipstick (Infrared) but I'm definitely being drawn to spend a lot more money there. The cream blushes are just so creamy (d'uh). I only have one cream blusher, an peachy Urban Decay one, and although it's not very vibrant by itself, it is great with a similar coloured powder over the top (like my Illamasqua Lover). When I buy a more pink cream blush I'll definitely look to Topshop. 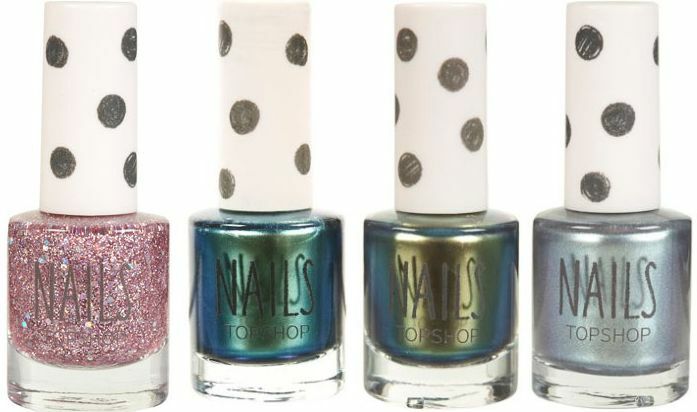 Topshop have a really good selection of nail varnishes, all £5-6 I believe. 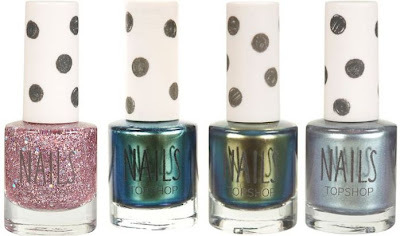 Here's a few that I am desperate to see on my nails soon. I think they speak for themselves. I love teal, glitter and duo chrome finishes. Swoon. I was also rather attracted to their Cheek Stick in Prism. It looks similar to a Nars Multiple (in maybe Cococabana or Luxor) and blended really well into the skin. As with blushers, most of the ones I have are powder, so I may just have to try this so that I have all my bases covered. Though a very new make-up range, they already have a lot of choice. The prices are all slightly higher than most drugstore brands but a few pounds cheaper than MAC (and most people would say they are comparable in quality). In other news, I have been given a rather fabulous gift of IKEA vouchers and so am finally able to buy a dressing table and somewhere proper to store my make-up. Until know I've had most of it balancing precariously on the ends of bookshelves. 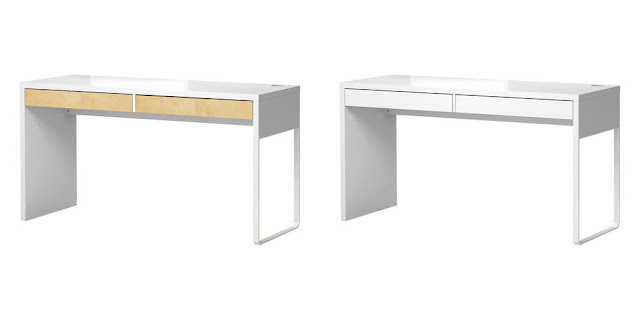 Straightaway I thought yes, I can finally get the MALM dressing table I've had my eye on. However, it's £95 and would not allow me to get the storage unit I would like. They have a desk, MICKE, that is fairly similar although a bit longer and with 2 drawers instead of 1. It has a hole in the corner for wires but that is easily covered up. It is £59.99 and I'm debating whether to get it in all white or white with birch drawers. What do you think? I have a few storage options but that choice depends on which dresser I choose. So exciting! I'm looking forwards to showing you it all once bought. Next post from the new flat, hope I can do it soon! .Tanya Burr - Make-up Artist.